› Is my price unreasonable? Is my price reasonable? High? Low? Sometimes we try to reach the wrong market. To explain myself. I use to sell parts at swap meets, Charlotte speedway in spring and fall, Charlotte fairgrounds, Maggie Valley etc.. I was talking with guy next to me and ask how I could sell more. He looked at what I had which usually to 3 or 4 spots to put out. He said my prices were too low to go up on price, lol. He said I was trying to sell to the wrong group of car guys. He said that higher prices brought in the guy with money would buy quicker and not be afraid of my low prices. He was right I raised prices and I sold more, lol. Most people are not going to have $9,000 or $10,000 to go out an buy a car needing $20,000 in work for a full restore. I would not cut the price myself. Your car is a desirable color and model. Just take to some shows this year and someone will walk up and want it. Charlotte in a few weeks is a great place for that. Especially the Mustang 55 show. Everyone there is a Mustang fan. I get lots of attention at shows because so few 71 - 73 come out. I was only one in Charlotte last year and several wanted me to price the car. I did at one show he had one new and his wife crashed and totaled it. H came over wanted to sit in the car, start it and looked it over for an hour. I gave him price three times what I paid for it and he came back again and kept looking. I was afraid he was going to take it, lol. Only driver I have right now. I think you are "reasonable" AND in fact possibly THE VALUE of cars offered in that range !! 1) TO ME "the seller" is as important as the SALE pitch! I vet everything before spending my money (to help others). YOU seem to be a great guy, member , seller ! HELL - you have even lowered price 5% to show you are negotiable , MAKING AN EFFORT ! 2) Have seen this car on FB group - with comment - "wish you were closer" or WISH I WAS CLOSER. PEOPLE that can't pay to ship , or don't know what it takes to get a better car BY SHIPPING shouldn't effect your price, sale or thought that you car is bad! I remember your post of "not sure if I want to finish" - MY GUESS is that the "NEXT PART" is daunting, more expensive and or you don't have the painting connections to do cost effectively -then putting you in the I GOT SO MUCH in this car (with a replaced pan and yada yada yada). P.S. So you know I'm not a buyer for this - though I just wrote the IRS a similar check! I do know a possible party - do you like 72 Sprints? 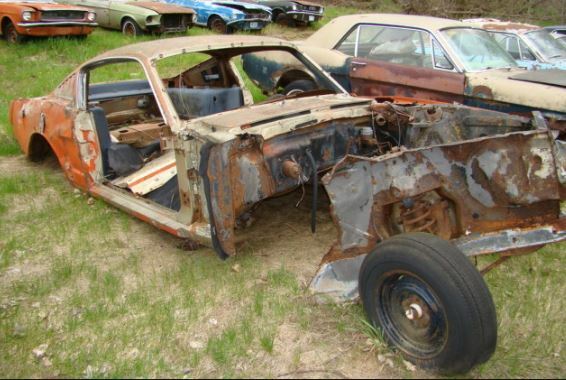 $4300 for this H-code pile of rust is why I say you need to stick to your asking. Your car is very desirable in that it's a Mach1, a 4V 351C and a 4 speed. If someone doesn't like the color, they can change it when it's painted. (03-22-2019, 09:30 AM)Hemikiller Wrote: Your price is fine. Holy SH*T Batman! You ain't kidding. That's a parts car at best, may be a grand! Personally I think Wade is too low and will only attract tire kickers He's already done a lot of the heavy lifting mechanically. With a bit of searching it could be painted quite reasonably and the interior isn't that expensive either. I did mine for less then 15 grand (Canadian) 4 years ago so about 11-12K US. That did not include seat cover as they were new when bought. That would still put the car still at good value imo. When I look at something like this, I ask - how much of the original car is left for me to reconstruct ... I instantly tot up the amount I'm going to have to shell out to get this to top spec. ....then look at the asking price ... if it fits together, then I buy it ... if it doesn't, I tend to run away unless I can do a deal. Knowing what I know now, regarding what it takes to get one back together and nice (not necessarily faithfully restored), I would happily pay your price. I like that it's a 'no stripes/no spoilers' car, too. Those big fat Cobras and Centerlines actually appeal to me as well. Yeah, David's right that it could take upwards of $20K to get it back to good, depending on the level of restoration or restomod one would fancy, maybe even more. But what people don't realize is that these project cars never come out in financial favor of the person doing the work required to make it nice again. When potential buyers try to low-ball a seller, they don't realize, or maybe just don't care, that the seller is already taking a loss just trying to sell it. I wish I was in the market, because my in-laws all live in Sumter, and my wife prefers to drive when we visit them, rather than fly. It would be no big deal to roll out there in my Ram, get a one-way U-haul car trailer, and take an extra day driving back to West Texas. I'm sure you guys are going to roll your eyes but I am really wanting a new GT (meaning a year old). I want something to get in and drive and enjoy now. The wife says no unless I sale this one. I wish I could keep it and still buy a newer one. (03-22-2019, 10:54 AM)scgamecock Wrote: I'm sure you guys are going to roll your eyes but I am really wanting a new GT (meaning a year old). I want something to get in and drive and enjoy now. …...Then we would never hear form you again!! (03-22-2019, 10:54 AM)scgamecock Wrote: I'm sure you guys are going to roll your eyes but I am really wanting a new GT (meaning a year old). I want something to get in and drive and enjoy now. The wife says no unless I sale this one. I wish I could keep it and still buy a newer one.